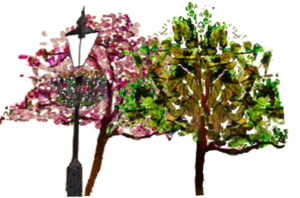 Harrogate International Festivals 50th Anniversaty trees are situated along Slingsby Walk on the picturesque Harrogate Stray. Each tree is indicated on the map by a number with the dedication shown in the key below. Please see this key to read each dedication. These trees are a beautiful addition to The Stray with a mixture of species and we do hope that you enjoy their presence for many years to come. 24. In memory of Sybil and Thomas Anderson. Splendid parents, much missed. 40. One is nearer God’s heart in a garden than anywhere else on earth. 44. Thomas Ronald Wood and Kathleen Mary Wood. They loved Harrogate and the Stray.